I've just cut into my recent bake, not entirely happy with the results. From the picture would you say the problem is under fermentation? Maybe the starter was not ready though it seemed active? I think the ferment was done just fine. 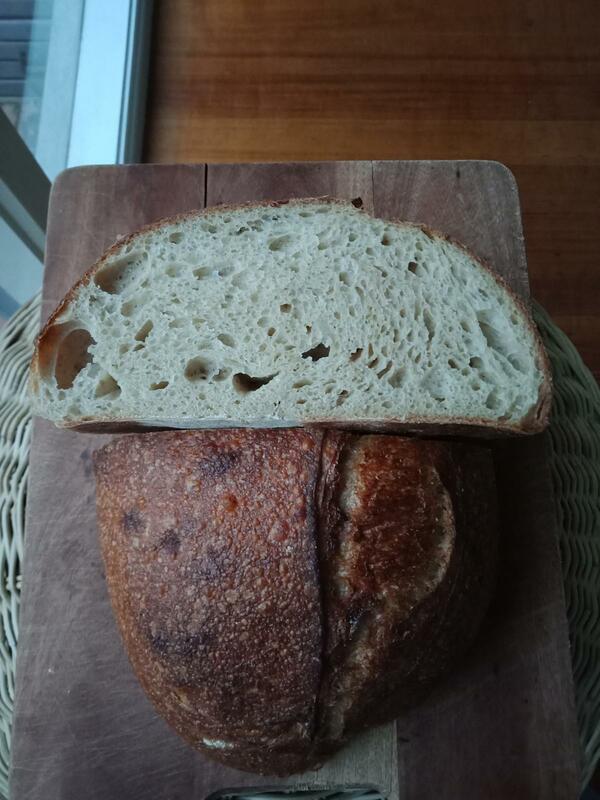 For a different type of crumb you'd want to focus on the handling and experiment with hydration. Higher hydration will encourage a more open crumb but with the right approach you wouldn't have to rely on it. What is your recipe and method? I did a 45min autolyese then added the starter, after anther 40min added salt then over the next 4 hours did 4 stretch and folds, shaped then put in the fridge for 16hours before baking. I was hoping for a more open crumb. So more experimentation with the process is what I will do. i totally agree with Abe. i totally agree with Abe. good distribution and size of holes, looks delicious....more water and better handling but as Abe says hydration isnt necessarily the answer. Good tasting bread is. Yes thanks the bread tastes great but trying to open the crumb more, will experiment with the handling. That is an excellent result. I highly recommend purchasing Trevor Wilson's Open Crumb Mastery. It's a must read, and not just for the goal of achieving open crumb, but for baking in general. Thanks yes I've read that book, great book the most informative I"ve read. Will try some of the alternatives in there. Do you think an all day surpluses with salt at room temperature of 22degees celcious is OK? I'm not sure what you mean. Please detail your process. This is why you should detail your process. It's hard to advise on a process we know little about. Based on what you've said, autolyse by definition contains no salt. All day autolyse is longer than most advise is necessary. The optimal time is usually stated as somewhere between 20 minutes and 3 hours, but as you'll find, there is actually a significant variation in practice. Please see process above, in reply to Abe. Once water has penetrated to the center of the largest piece of cracked grain, the autolyse time is just waiting for the enzymes to do their thing. The amylase enzymes will do most of their job in 20 minutes (it is an exponential process) but there are probably other factors at work. Some believe that the delay allows the yeast and LAB that were in stasis to crank up their machinery for growth but how long that takes depends on the maturity of the levain, and my calculation says that almost any starter that is still foamy has everything intact and doesn't need any lag time to rebuild the cellular machinery for reproduction - it just needs glucose. Great thanks, if I extended the aotolyese out to say 8hours would there be any detrimental effects on gluten? it would seem that an 8-hour autolyse would be pushing your luck. Depending on which camp you are in, the hazards of long autolyse include rogue yeasts and bacteria from the flour multiplying up to levels that allow it to successfully compete with whatever leavening you choose to add. To forestall this you can add salt and/or refrigerate the dough. My experience is that the vast majority of the benefit of autolyse is the complete hydration of the flour, the formation of gluten, and the conversion of broken starch into maltose by amylase enzymes native to the flour. You get almost all of that in 20 minutes with a little more if you wait somewhat longer, but beyond an hour or two I am not convinced that you get any significant gluten "softening" or "degradation" until the pH gets down below 5.0. For a flour/water dough, the pH is so high that protease activity is extremely low and thus the claimed "gluten softening" is more myth than demonstrable reality. OK thanks for that information, will get back and try again. OK thanks for your insight will try again. This has been my ongoing struggle with all sorts of breads. If I proof in my oven (it has a "bread proof mode" of 100 degrees) then the bread gets spongy. If I proof on the counter it a) takes hours and b) ends up being as dense as a cinderblock. Autolysing for an hour has helped me with a light challah I finally was able to produce, as has adding in steam to the oven when baking. Higher hydration too, but that feels like cheating ('sup ciabatta). I also thing, counter-intuitively, sometimes more handling can be better (see focaccia push downs), but only if a very active yeast that can refill the dough after it is manipulated.